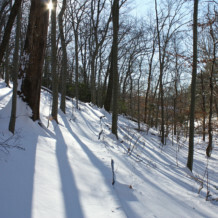 Winter is a wonderful time to explore Glen Providence Park! With the leaves down, we have a clearer view of this steep valley’s topography, and the trees can show off their elegant form, at times with a lovely blanket of snow. We will walk the park’s trails and get an introduction on how to identify trees through their structure, bark, buds, branch patterns, scent, and other details! John Wenderoth and Ted Cavey will introduce us to the basics of winter tree identification. We will start on the sledding hill, where there are trees that long pre-date the park, and trees that were planted in its early years- Glen Providence Park was dedicated as a Bird Sanctuary and Arboretum, after all! We will continue along the park’s trails, looking for examples of different tree species to identify. John and Ted lead tree walks at Tyler Arboretum, where they volunteer at Tyler’s American Chestnut Orchard– which is how we met them! John also helped us confirm the two American Chestnut trees we found still surviving in Glen Providence Park. – Be prepared for steep hills, and uneven (possibly wet or icy) terrain: wear your hiking shoes, and bring a hiking pole if you use one. – To add this event to your favorite calendar program (iCal, Outlook, Google, etc. ), view the event listing on our calendar. * In the event of truly inclement weather, we will post a cancellation on our website and facebook the morning of the Tree Walk.